We all want our homes to smell welcoming, but it’s not always easy to maintain that clean scent between pets, lingering food smells, kids and well … just living. I love Febreze, but it’s not very cheap. It can take a solid bite out of your budget if you use it regularly. In my quest to lower costs without sacrificing quality, I went to my favorite source of inspiration: Pinterest. 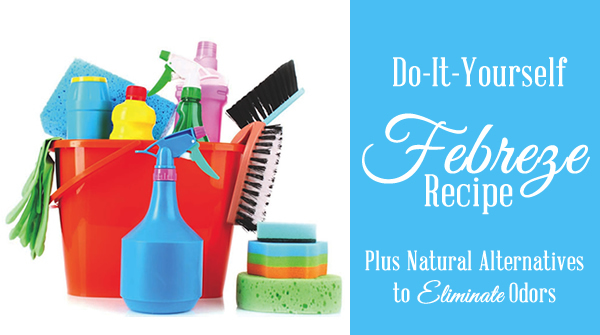 I found a great recipe for homemade Febreze from Life Family Love. Please note: This is a low-cost, homemade recipe, but it is not a natural or green recipe. So if you were looking for a recipe without chemicals, this is not the recipe for you. I was immediately intrigued because for the price of fabric softener, I could make a year’s worth of substitute Febreze for my small apartment. Plus, a small bottle of fabric softener cost less than one bottle of Febreze. Major score! I gave it a try and have been very happy with the overall results. Pour fabric softener and baking soda into your spray bottle using a funnel. Fill spray bottle with hot tap water, screw on cap (and twist nozzle to lock) and shake well. Please note: I had no issues with it leaving spots or marks on furniture or fabrics, but please TEST first. Do not use on leather, suede or silk. I know not everyone is a fan of Febreze or air fresheners in general due to all the chemicals they contain. Here are a few simple ways to freshen your home naturally. I know this seems obvious, but every home needs a good airing out a few times a year. On a nice day, open up the windows and let the cool, fresh air do its job. Baking soda does more than make baked goods rise; it also absorbs tons of stinky smells from pet accidents to garbage odors. Generously coat the offending area with baking soda and let it set for a few minutes to absorb the smell. Vaccuum and you should eliminate or vastly reduce the smell. We may like coming home to the smell of chocolate chip cookies baking in the oven, but the truth is food smells build up in our kitchen over time. And it can get a bit stinky. Vinegar is the best way to tackle those smells. Spray your counters and kitchen walls with vinegar and wipe dry. If you cook or fry something with a particularly strong odor, boil a teaspoon of white vinegar in 2 cups of water. Those odors will be gone faster than you can bake a tray of cookies. Be aware that when you use vinegar as a cleaning solution, it will smell very vinegary for a short period of time. The smell will fade after a few minutes.